You HAVE TO use one of your own products, or a gift card to your store, as the prize for your contest. Unless you’re Apple, never give away an iPad. Making an iPad the prize will generate a lot of entries in your contest, but they will only be from people who are interested in iPads, not in your business or the things you sell. Now, you may say, “But my business’ target market is interested in iPads; won’t I still get targeted entrants?” Yes, you will get entries from people in your target market, but there is no way of knowing if they are interested in the products you are selling right now, or will be soon. It makes sure every entrant is interested in your products since they will obviously be able to use the prize only to purchase items from your store. It will create the largest possible target audience for contest entrants. If you give away a certain prize, you will get entries only from people interested in that prize. This will serve to deter entrants, especially if the item you’re giving away is gender-based or can be used only for niche activities. Once these people have entered your contest, you need to act fast to optimize your opportunity to turn them into a sale. You can do this by setting up an auto-response email that is sent to every person who enters your contest, right after they enter. Include an incentive, such as a small coupon, and a call-to-action to use on their first purchase at your store or eCommerce website. 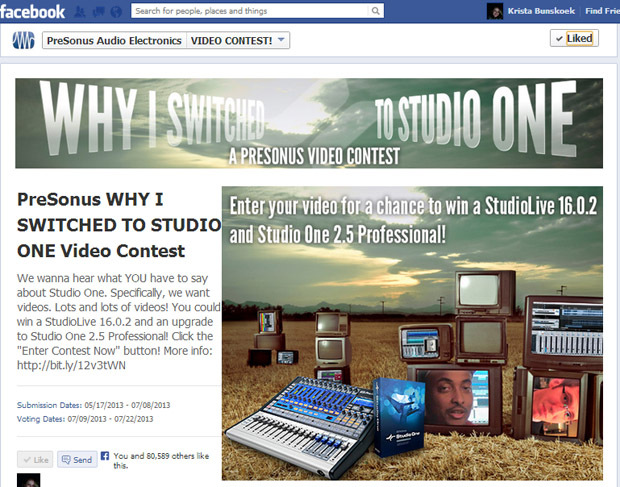 For a business looking to increase their Facebook Likes, a Facebook contest is golden. Studies show free giveaways are one of the top reasons people Like Facebook pages. And within a Facebook page tab, it’s simple to require people to Like your Facebook page to access your contest. How do you get Facebook Likes from a Facebook contest? It’s easy. Third-party Facebook contest apps, such as Wishpond, have a built-in a “like-gate” feature. This feature makes the entry page within a contest app hidden to users unless they have “Liked” your Facebook page. 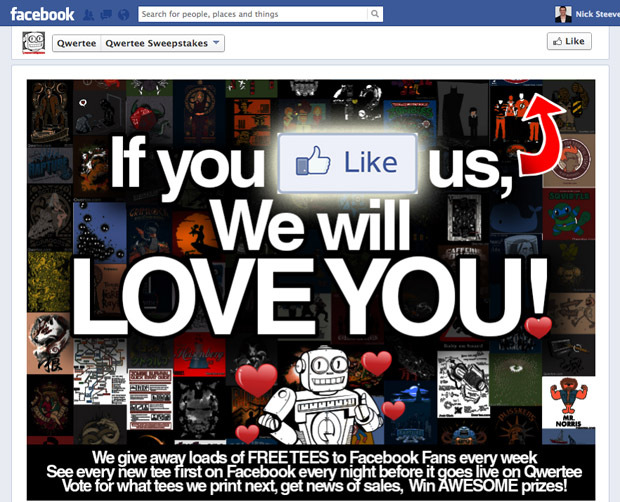 A like-gate is usually a simple image with text telling users who don’t like your Facebook page that they need to like it to access the current contest. Once a non-fan likes your Facebook page, the app will automatically reload to show the default entry or voting page on which the user can enter the contest. You just need to upload your like-gate image and the app will take care of the rest. 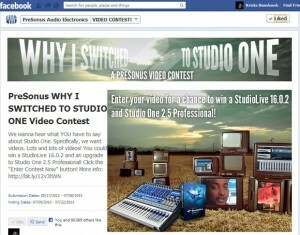 Is it against Facebook’s Promotions Guidelines to like-gate a contest on a Facebook page? No! Because the act of liking the Facebook page does not enter a user into a contest, it is within Facebook’s Promotions Guidelines. What is the typical drop-off rate for like-gated contests? Typically you can expect a minimal (10 percent) drop-off rate for your contest due to a like-gate. Using a like-gate is more than worth this drop-off as the other 90 percent or more of non-fans who do like your page will open a new avenue to market them again and again. According to a recent Forrester Research report, “70 percent of US online adults trust brand or product recommendations from friends and family.” That same report indicated that 46 percent trust online reviews written by customers, but only 10 percent trust online ads and company-written text messages. This means that getting customer testimonials for your business and products is a huge opportunity to get new sales. And the easiest way to get testimonials is to ask your customers for them for the chance to win a prize. You can use a photo, video or text essay contest to get people to share photos and videos of themselves using your products or write why they love them so much. 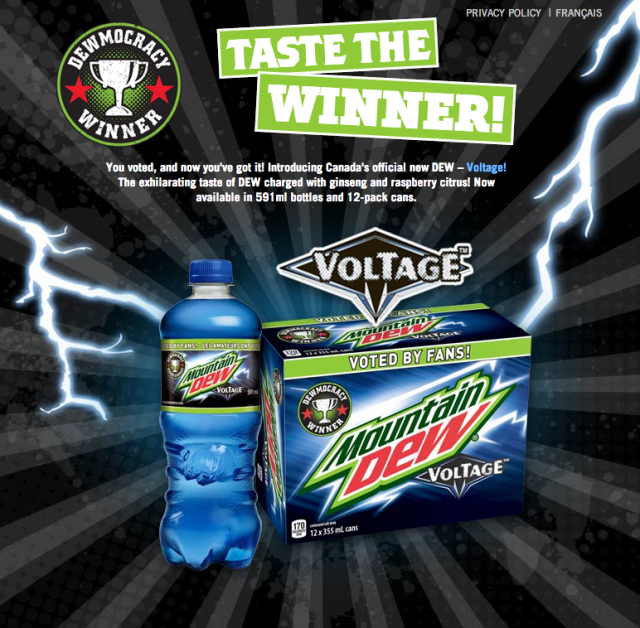 Built-in sharing and voting options can make these testimonials go viral: If you choose to decide the winner based on which submission gets the most votes, people will be propelled to share theirs constantly to get the most votes. This will give your testimonials tons of viewers, especially from entrants’ friends. Friends of entrants will be enticed to learn more about the business and product that their friend is praising, thus driving new traffic and qualified leads to your store. Tell us how you use [product name] to win! Share a photo of yourself using [product name] to win! Share a Vine of you and your friends at a [business name] location to win! You can also use a vote contest to get customer testimonials. The advantage of this type of a contest is that the barrier to entry is much lower than a text essay or photo contest: People only need to click “Vote” for their favorite item instead of having to think up a response. After your vote contest is complete, you can take the ones with the most votes and list them as your highest customer-rated products. A Facebook contest is a great way to drive awareness for a new product. You can get people reading about its specification and value, and sharing them with their friends by doing a simple giveaway of the product to one or more winners. You can also get people involved during the design process of your product to both get them engaged and utilize their feedback to improve your products. This is a much more fun and cost-effective way to promote new products than say a print or TV ad campaign. Stitch Collective has built a niche for its business by completely crowdsourcing it’s product design through the use of voting competitions. It asks their customers to vote on which bag designs they should turn into real products to sell. Tell us how you’ll wear our new [fashion item] to win! Tell us where you’ll go with our new [piece of sports equipment] to win! What new dish would you like to see on our menu? User-generated content, including photos, videos and text, are great assets for social media marketing campaigns. People don’t want to be bombarded with corporate messaging on social media, so you need to craft your campaigns in a way that focuses on real people. The easiest way to do this is to have a stock of content from real people people to fill your campaign with. People love to see their content, and that of their friends, shared by brands because it gives them a short ,15-seconds of fame to that brand’s thousands or millions of fans and followers. Using their content instead of your own will give it a spark to go viral through specific communities from those close to the content creator. And you can boost this effect by including content from clubs and teams with many members. Companies like Walmart, Coca Cola and Hubspot utilize user-generated content by using it to create their Facebook page’s cover photos. Photo, video and text essay contests are easy ways to generate this content from your users by offering them the chance to win a prize. Share a video of your family [doing an activity] to win! Share a photo of your morning face to Win! The best way to drive new, targeted people to your contest is with Facebook ads. And using Facebook ads’ conversion pixel you can easily track how much you’re paying for each ad click and entry into your contest. Check out Social Media Examiner’s article, How to track your Facebook ad conversions, for a great guide on how to setup tracking and view the results. What do you think? How do you measure ROI on your Facebook campaigns? What do you feel are the most important returns? Nick Steeves is the Director of Marketing at Wishpond. He writes guides & analysis for online retail marketing. Wishpond is an All-In-One Marketing Suite for Retailers. It allows retailers to market their products across web, mobile, social and local platforms.